The Clinton County Port Authority hosted the first quarterly meeting for the Dayton Development Coalition’s (DDC) region, bringing together economic development leaders from the 14-county region. Joining them were representatives from several of the region’s workforce development offices, colleges, and other workforce development professionals. 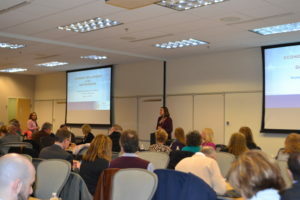 Julie Sullivan, DDC Executive Vice President of Regional Development, introduced the new format combining the groups. An around-the-room introduction revealed a good mix of workforce and economic development representatives. The balance of the morning saw several presentations from JobsOhio, the DDC and member-partners on topics including Talent and Workforce in Ohio; ACT Work-Ready Communities; Site Visit Preplanning and Debrief Best Practices, and an outline for the upcoming DDC visit to China. The group engaged in a robust discussion around the ACT Work-Ready Communities. Brenda Latanza from Preble County and Amy Donahoe from Springfield led that discussion, explaining benefits they had seen in getting their larger community involved with the program. The morning wrapped up with a tour of the Wilmington Air Park. For many in the region, it was a first visit and a great chance to see the airport and the facilities.